Recent changes seem to be helping the lottery game compete with Powerball. Mega Millions' home page shows the game's biggest jackpot since March 2012. The worse the odds, the more people play. It defies sense at first blush, but the explanation is that longer odds mean bigger jackpots, and it's "show me the money" that motivates people most. Mega Millions, which worsened its odds 50 percent in late October, is now enjoying its strongest jackpot run in more than a year and a half. Last night, the jackpot went up to $291 million for the annuity, $147 million for the cash, because no one matched all the numbers drawn: 7, 12, 41, 44 and 59, with a Mega Ball of 3. 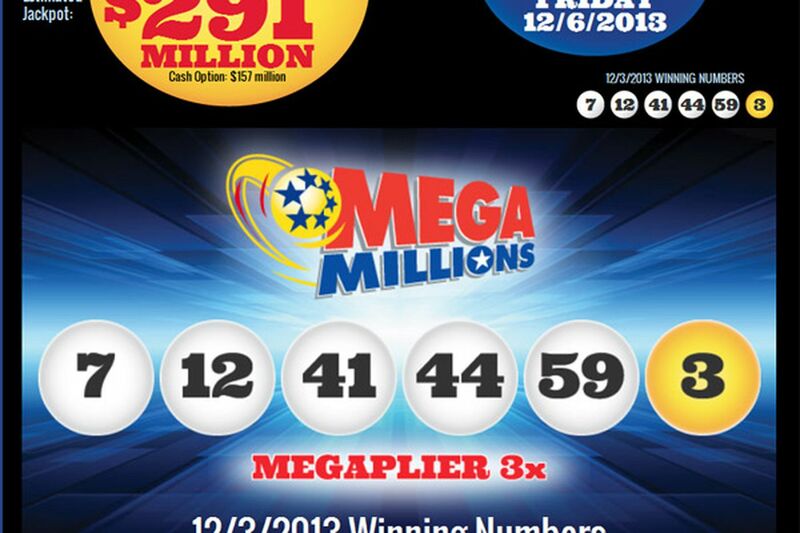 The biggest winner was a Missouri ticket that won $1 million for matching the first five numbers but not the Mega Ball. The new jackpot blows away any of the previous 20, none of which topped $200 million. It also dwarfs the current Powerball jackpot, which rose to $81 million on Saturday night, when no one matched all the numbers -- 5, 26, 44, 45 and 57, with a Powerball of 29. The Mega Millions jackpot is by far the game's biggest since March 2012, when the game set the all-time U.S. lottery jackpot record of $656 million. After that, changes in Powerball -- $2 tickets, a $40 million minimum jackpot, $10 million minimum increases, and $2 million for some second-place winners – fueled a series of enormous jackpots that eclipsed anything Mega Millions had to offer. Just this year, four Powerball jackpots surpassed $300 million, including one for $448 million and another for $590.5 million – and that one took just 13 drawings to reach. Mega Million's previous biggest this year, a $198 million jackpot hit in May in New Jersey and Virginia, had to roll over 18 times to get that high. Powerball kept getting much bigger must faster. Since setting its record, Mega Millions had 16 jackpots fail to reach $100 million. So, on Oct. 22, Mega Millions underwent an overhaul, raising the minimum jackpot from $12 million to $15 million, establishing a minimum increase of $5 million, boosting the second-place money to a minimum $1 million (up from $250,000) and a maximum $5 million (up from $1 million), and giving players a lot more numbers to choose from – 1 to 75 for the first five numbers, instead of 1 to 56 – while making the range of numbers for the Mega Ball just 1 to 15. One thing that didn't change: The $1 price per ticket. The changes in the numbers radically altered the chances of hitting the jackpot – from 1 in 175 million to 1 in 259 million. The higher numbers also work against people who like to play dates (birthdays, anniversaries), ages, or even popular patterns like 1-2-3-4-5 or 2-4-6-8-10. Eleven of the last 13 drawings included at least one of the new higher numbers, and the Nov. 26 drawing had three! If the jackpot rolls over Friday night -- and the odds are good it could -- expect it to rocket to $330 million or more, judging from the string of bigger and bigger increases. Basically, the changes have made the game more appealing to those willing to drop a dollar on a dream. But if you're looking to win less than a fortune, know that other games offer much better odds. For example, if you pull off the 1-in-739,000 shot of matching four numbers plus the Mega Ball -- missing only one number -- Mega Millions will pay you $5,000. You'd have ten times better odds at winning four times as much playing 50-50 at a Phillies or Flyers game. Note how despite more than 35 million tickets sold, only one won $1 million. For more on lotteries, go to Philly.com's lottery page, or the websites for Mega Millions or Powerball.